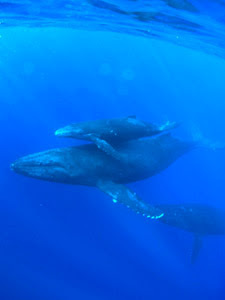 For many years Japan has been "buying" votes to support its return to commercial whaling. It's easily done when you consider every member of the IWC has only one vote and some of the poorer nations can achieve rich rewards by signing onto Japan's party line. It comes as no surprise that smaller nations can be encouraged to join the IWC, even though they have no history of whaling - or even any of their own future plans for whaling. All it takes is an overseas fisheries grant to fill their coffers, a handshake from a Japanese official and another consolidated vote joins the support of the pro-whaling nations. What does come as a surprise is when member states that signed up during the initial membership of the IWC as conservationists, vocally supporting the ant-whaling line, suddenly change their stance and begin voting with Japan. St. Lucia and St. Vincent & the Grenadines signed up for five years as anti-whaling advocates. But five years later, and after an invited guest visit to Tokyo to "review the economic relations between Japan and their respective countries and urging Japanese aid and investment." they suddenly change sides. Looking at the balance sheet it can be seen that each country benefited from a US$2.5 Million fisheries grant and since have taken between US$30 and US$40 Million in grant aid from the Japanese since. The contempt Japan holds for the IWC is blatantly apparent when senior officials like Masayuki Komatsu see nothing wrong in using aid to induce the support of such nations by funding them "to get an appreciation of Japan's position." Japan continues to buy votes from countries, urging them to join the IWC and support their pro-whaling stance. So What’s the Deal About Whales? Do People Really Eat That?? ?